Pueblo Esther is a small community to the south of Rosario in the Province of Santa Fe, which has accustomed us to news stories concerning the UFO phenomenon. Several persons claim having seen lights in the fields, ad the locality indeed boasts a significant case history. 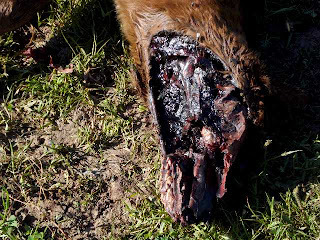 On this occasion, the news involves the appearance of a mutilated animal, specifically a young horse, found with the typical incision to its jaw, total extraction of the eyeball and excision of the ear canal and the tongue, leaving the hyoid bones exposed. 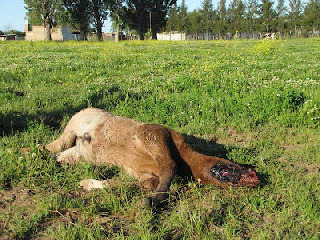 The case was reported by Fernando Schienke, who found the horse in a field near his home. Astonished by the injuries to the specimen, he tried to find information about them. The animal was found on October 17, 2010 and we are still waiting for more details from the witness. In the meantime, we are disclosing a series of details on the investigation. A series of photos will show the aspects to be kept in mind when investigating mutilation cases. We can quickly observe that the wound presents a net incision with tissue dehydration and in some parts, removal of hair down to the skin along the cut. The type of incision can be clearly made out in a magnified photo. There is neither tearing nor remnants of tissue on the bone, which turns out to be one of the differentiating factors. The presence of flies: this factor is very interesting, since many pathologists argue that the loss of soft tissue is due to phagocytosis by fly larvae. These photos show how flies begin to work on the animal’s carcass. No colonies of bacteria are visible, no fly larvae. This indicates the insects’ first contact with the carcass. However, the wounds are as latent as the incisions. Over years of investigation we have been able to establish some basic patterns, the start of action by flies, the carrion animals that appear first, such as the wild boar, as well as some birds. However, all of them appear some 72 hours after an animal presenting these injuries has been found. Birds tend to make their mark through feces on the back of the animal. We are expecting more details on the case with a follow-up of the area. This incident is a test case for Vision Ovni, as the town of Pueblo Esther is an area of multiple sightings, and a very important item of information for research as a whole.